Hi Guys. I had a romantic dinner with one of my best friends last night and we partied like we were 25...except we're not...and she has two munchkins and I had to be at work at 7:00am....anyway will share our romantic dinner with you another time. I'm a little overwhelmed over here, so I apologize for the lack of posts...or outfits...or really anything interesting haha If I was half as productive as I was HERE...as well as enjoying Summer...then maybe I would have somethin..but I don't...sooo yeah...I'm super excited to show you guys pics of our rehearsal last weekend for our short film..I will share more...promise...man..I sure am makin a lot of promises....now if only I could actually have a weekend to do it all...no such luck folks...no such luck...till then...enjoy your Thursday...I told a client to have a nice weekend on Tuesday...if that is any indication of how my week has been going! Love the contrast of the mustard and the purple together. You look great! 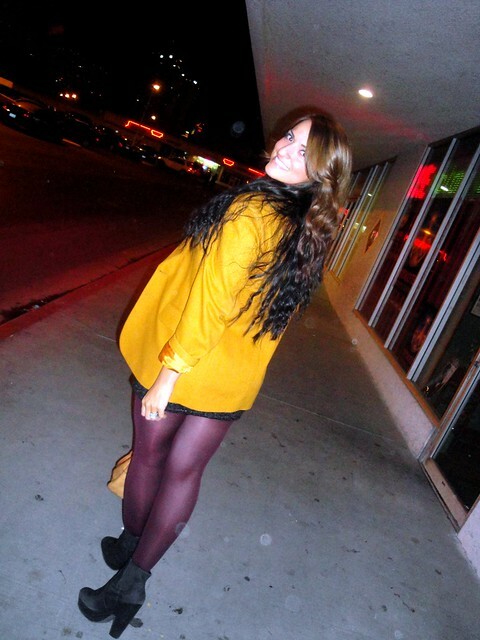 i loooove mustard and purple!! what a hot outfit!!! Love the blazer! You're totally allowed to take breaks. Nothing wrong with having a life. I have always loved Purple and mustand....you look awesome!! You look absolutely fantastic. I love the colors together. The blazer is a must have and the dress is super cute! You are gorgeous, sweetheart! Mustard and plum are one of my favorite color combos! I know blogging is time consuming and some days it just is what it is. I often blog until 3 in the morning because, you know, I have life :) so no need for apologies, you're not alone on this one! And besides you look fabulous! I've told other people this before because its true and I'll say it again: Complimentary color schemes are the absolute best for color blocking. And I love that your tights are purple. That is fantastic! You look great, as usual. That jacket...the dress...the purple tights...the boots! Not sure what piece I'm envying most. Thanks for linking up! You are killing it in those booties! What do people at work think of your style? I bet they look forward to seeing you every day. Have a good weekend (for reals, cuz its Friday) hehe. great blog... i'm totally amazed by all those posts i see. you inspired me so much, so i have to go thrift shopping AGAIN tomorrow.